Regina Simons called the alleged assault "very predatory, very aggressive and traumatizing" during an interview that aired Friday on "Megyn Kelly Today." Other women have accused Seagal of sexual misconduct. 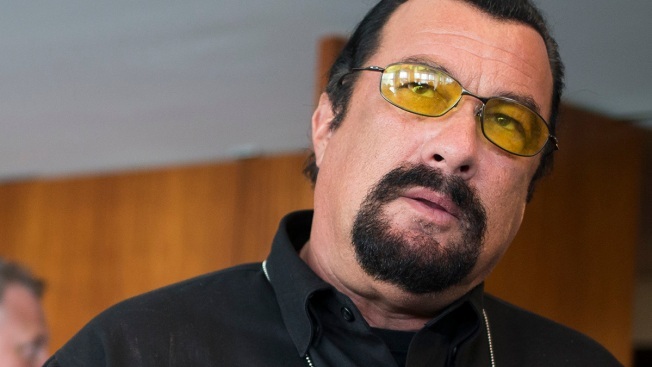 Jenny McCarthy said the action star sexually harassed her during a 1995 audition, while Portia de Rossi accused Seagal of unzipping his pants during an audition. A once-aspiring actress has alleged Steven Seagal raped her at a wrap party for the film "On Deadly Ground," claiming he undressed her and assaulted her on his bed while she focused on a photo of Seagal's wife on the nightstand. Regina Simons called the alleged assault "very predatory, very aggressive and traumatizing" during an interview that aired Friday on NBC's "Megyn Kelly Today." She was 18 at the time. Seagal's lawyer did not immediately return calls for comment Friday. Simons said she was surprised to find that she was the only one invited to Seagal's 1993 party to celebrate the end of filming. She had been an extra and said "before I knew it, he was on top of me and I couldn't move." She says she froze and "felt like I left my body." During the alleged attack, Simons said she remembers looking at a photo of Seagal and "the lady from 'Weird Science.'" At the time, Seagal was married to Kelly LeBrock, who starred in "Weird Science." Simon said she reported her allegations to Beverly Hills, California police, where the incident occurred. A Seagal spokesman denied McCarthy's accusations to The Daily Beast. McCarthy told the same story to Movieline in 1998.